This week, I managed to finish all my work by Wednesday and so this obviously deserved some sort of reward. For me, there’s no greater treat than going to Borough Market and spending most of what I’ve just earned and so that’s where I headed, bribing the youngest child with artisan croissant to stay in his pushchair and not yell ‘POO!’ at passers-by. A trip to Neal’s Yard Dairy was always on the cards and I’d also stocked up on several of life’s other essentials (you know the sort of thing – clams, vino cotto, smoked paprika in a pretty tin) when I was starting to mosey towards the exit. 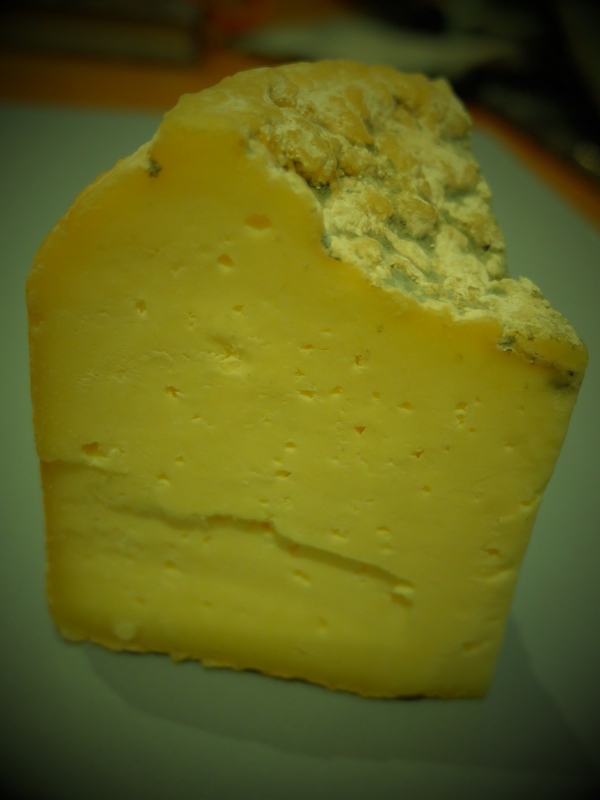 Alexandra is a semi-hard, pasteurised, cow’s milk cheese. The aforementioned Wildes Cheese is based in Tottenham and was started by Philip Wilton in 2012. Philip used to be a management consultant but when they offered him redundancy, he seized it with both hands, rolled up his sleeves and plunged them into curd. He’d dabbled with home cheese-making before but always thought that cheese-makers had to live in more bucolic pastures than in the shadow of the Spurs stadium. He didn’t want to leave London though so when he saw micro-breweries popping up left, right and centre, he thought, ‘Well, why not a micro-dairy?’ He took some courses in how to make cheese and how not to kill people with it, found a unit on an industrial estate and Wildes Cheese was born. He first started selling at local markets, one of which was Alexandra Palace, hence the name of this cheese (which is also known as Ally Pally). He produces a mind-boggling array of different cheeses that take their influence from all round the world: a Latin American-style mozzarella, a feta-style cheese marinated in lemon, a ‘white-blue’ cheese and a soft, oozy ‘Brie’ in a fluffy white coat. There is even talk of producing cheese dipped in chocolate or a roulade made with sugar-roasted figs in brandy. Yowza. Philip’s philosophy is based around local food; he doesn’t want his cheeses to sell nationwide, preferring to supply his local area with an artisan product. Obviously, finding a big milky herd of cows wandering parallel to the North Circular is a trickier part of the equation and so he sources his milk from a single herd in Rye, Sussex. The milk varies with the seasons, as do the cheeses that Wilton chooses to produce. Philip wants people to embrace the seasonal and more quirky aspects of his cheese; that not every batch will be the same, that cheeses differ according to the cow’s diet, to the temperature of the dairy, to the mood of the cheesemaker. Having just been to Neal’s Yard, I was struck by how different his stall looked. You’ve got to love Neal’s Yard but its display of cheeses is, as you would expect, very Peter Perfect, all in perfect little stacks and wheels and looking like they’ve been dusted and maybe touched up with some Tippex. In comparison, Philip’s stall was like something from a French market day, lots of different cheeses laid out in all their crusty, dribbly glory. I suspect that if I went next week I might find a whole different range. With additional research from The Telegraph, The Guardian and Jellied Eel. This sounds fabulous and I like his mind set! He sounds like such a cool guy, doesn’t he? Oh, mmmm, yum, that does sound good.I’ll have to alert the North London-living family to that one and get them to send me food parcels. Yes, I love it – the fact that he’s in the middle of London but takes the approach of a French peasant, plugging seasonality, change and local food. A shame for the rest of the country though! I love this post, your little story at the beginning drew me in…I can relate to bribing little ones in their pushchairs! And as always I love hearing about the weird and wonderful cheeses out there. Philip sounds like an inspirational guy!.